Connect fiber network devices for high-speed transfers with LSZH rated cable. 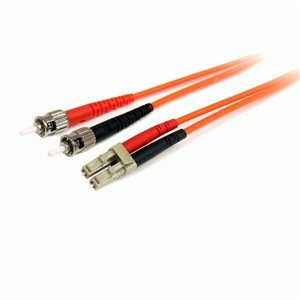 The FIBLCST1 1-meter (3.3ft) Multimode 62.5/125 Duplex Fiber Patch Cable is terminated with one LC (male) connector and one ST (male) connector, to provide the necessary connection between fiber networking devices for high-speed, long distance networks.This LC-ST patch cable is housed in a LSZH (Low-Smoke, Zero-Halogen) flame retardant jacket, to ensure minimal smoke, toxicity and corrosion when exposed to high sources of heat, in the event of a fire. Making it ideal for use in industrial settings, central offices and schools, as well as residential settings where building codes are a consideration.To ensure optimum performance, the multimode fiber duplex cable is individually tested and certified to be within acceptable optical insertion loss limits for guaranteed compatibility and 100% reliability.The LC-ST Multimode Fiber Patch cable is guaranteed to provide long-lasting dependability, and top quality performance. The FIBLCST1 1-meter (3.3ft) Multimode 62.5/125 Duplex Fiber Patch Cable is terminated with one LC (male) connector and one ST (male) connector, to provide the necessary connection between fiber networking devices for high-speed, long distance networks.